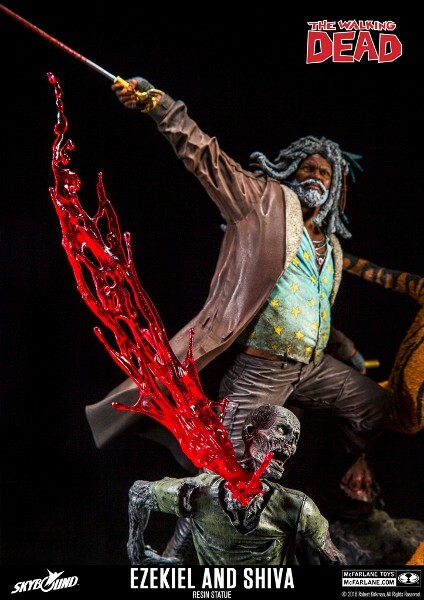 McFarlane The Walking Dead Ezekiel and Shiva Resin Statue. What can be said about the well respected and benevolent ruler of ‘The Kingdom’ simply does not do justice to how grand King Ezekiel was. His decrees were just, his character pristine. 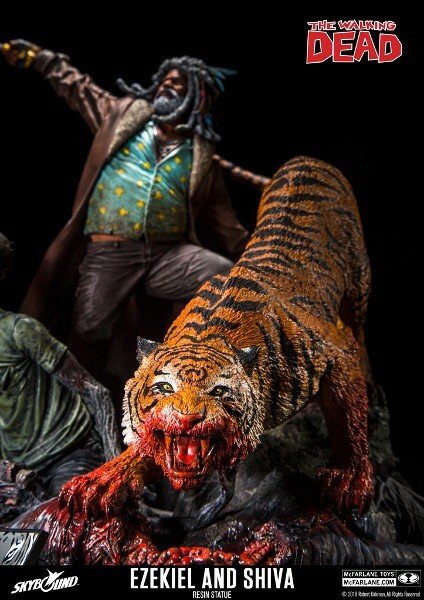 Alongside his faithful tiger Shiva, the King stood for life in such an abysmal world. He did not simply stand by and let the enemy and the dead take what belonged to his people, but was alongside them fighting tooth and claw for freedom. 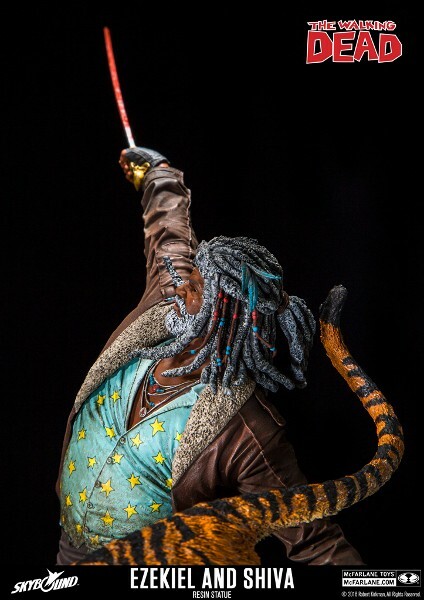 Majestically standing over 13 inches tall dispatching roving Walkers alongside Shiva. 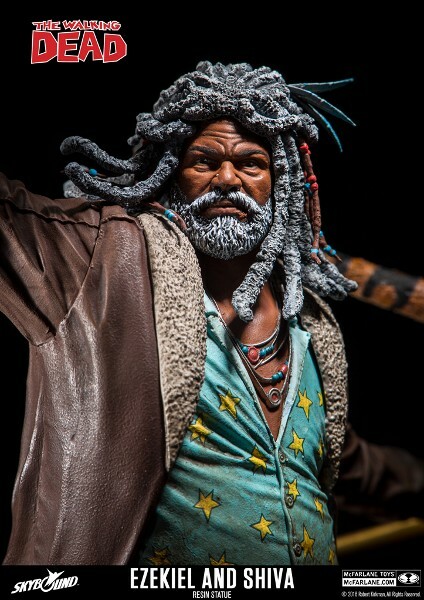 With acute attention to every detail from sword blade to whisker, the Ezekiel and Shiva statue was created, developed, and designed by Todd McFarlane and his award-winning McFarlane Toys design group, in conjunction with Robert Kirkman and Skybound Entertainment. This Statue Showcases Ezekiel, Shiva, and four Walkers. Statue is Hand Painted and is Made of Cold Cast Resin. It Features a Magnetic Assembly and a Rotating Base. Approximate Statue Dimensions are 13 Inches Tall by 11 Inches Wide. 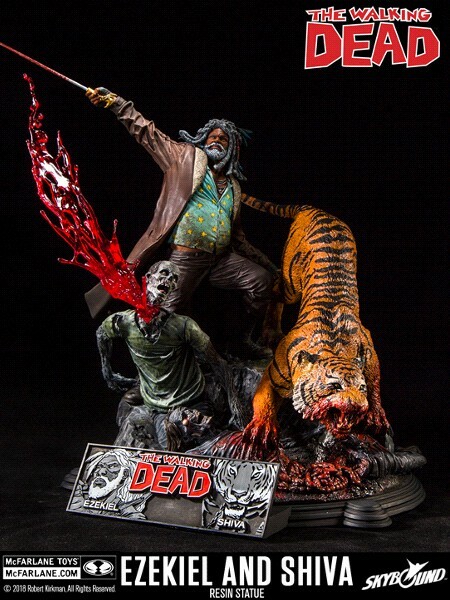 Each Statue is Individually and Sequentially Numbered and Includes a Certificate Of Authenticity Hand Signed by Todd Mcfarlane.